My plants came in moist and viable. I am surprised considering I live in California. Thanks, I am well pleased. Golden Privet Hedge has leaves with a vibrant yellow color, which can range from green to purple, based on the climate. The golden privet can be used as a showy hedge or an attractive tree. You may also want to use the golden privet as a living privacy fence. The golden privet loves a lovely moist, well-drained soil in full sun. The golden privet can handle some shade, but the leaves tend to change from yellow to a light green, so it is best to keep them in full sun, to keep their lovely color. You may also want to encourage your plant's growth by giving it a nice layer of mulch, to keep it moist, and also helps keep creatures away. These showy plants are very low maintenance; they will grow in almost any yard. This beautiful hedge has an added feature, it has small white blooms in the spring, making it even more popular. 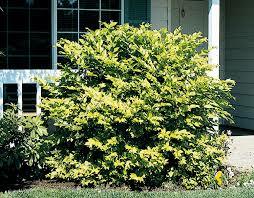 Golden Privet Hedge provides an abundant amount of interest without much hassle. These low maintenance shrubs need very little attention. You will want to fertilize them once in the fall and again in the spring. These plants will need a little trim, in the spring, once they finish flowering, this will help keep them in shape. They are most popular in a vase shape, but you can also do an oval or round shape. You will want to put an insecticide on the golden privet to keep away pests, such as mites and aphids. This is a fascinating plant for the annual garden because you are always changing out your annuals, and your golden privet is always changing colors too. The golden privet is also a great addition to wild gardens. Golden Privet Hedge are good for attracting butterflies and bees, as are other plants with flowers. These plants display showy leaf colors that will vary, based on the climate and soil. Golden privets have sweet glossy leaves, which are a lovely accent to almost any landscape. I like to plant the golden privet as the center of attention in my garden because it does offer such a fantastic color showing, and changes in the seasons, as the temperatures vary. In Florida, they typically stay yellow, which is a nice change compared to the standard privet, but it is my understanding in the northern zones, they can enjoy a purple showing of the leaves of their golden privet. So, no matter your region, enjoy the beautiful show the golden privet provides. 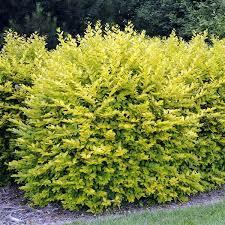 Golden Privet Hedges are a simple addition to a lot of benefit to any yard or flower garden.